FXLoader for Oracle E-Business Suite provides facilities for managing exchange rates in Oracle – loading daily rates, calculating period rates and exchange rate inquiry/reporting. Currency exchange rates are necessary for dealing with foreign currency transactions in any area of Oracle E-Business Suite. Daily Rates can be loaded from OANDA, Xignite, Reuters, XE and 40+ Central Banks, including The European Central Bank. .
OANDA is one of the most trusted sources of currency data. FXLoader are OANDA partners and provide their exchange rates service as part of the FXLoader subscription. The service provides daily market rates to every tradable currency, and central bank rates with their Advanced Plan. Xignite provide the Market Data Cloud on their enterprise-class delivery platform. Their currency rates service provides market rates to every tradable currency, plus rates published by a number of central banks around the world. FXLoader are Xignite partners, enabling us to provide their service as part of our subscription. Reuters DSS service provides web service access to their currency rates. XE uses 100+ international sources, filtered for errors, to ensure their currency data reflects accurate global rates. The ECB publishes EUR rates to approximately 33 major currencies. FXLoader can triangulate these rates to provide rates based on USD, or any other currency. FXLoader provides official central bank rates via Xignite, OANDA and direct within FXLoader. These are needed for statutory reporting in some countries. In addition to the core Daily Rates product, we also offer add-ons for Period Average Rates, Reports and a Web Inquiry Page. The products can be licensed separately or together. All products are installed in your existing Oracle E-Business Suite instance under a custom application, following Oracle’s standards for third-party extensions. A single installation script is provided for each product to automate the install. You will also receive a Reference Manual explaining the configurable parameters and a User Guide. Exchange rate reports require XML Publisher, generally available from 11.5.10 onwards. Most organizations using Oracle E-Business Suite require some multi-currency functionality. Oracle converts all transactions in foreign currency to your functional currency using a defined exchange rate – supplier and customer invoices and payments, GL journals, purchase orders, sales orders, etc. These exchange rates are known as Daily Rates in Oracle and are shared by all modules of E-Business Suite. FXLoader provides a fully automated interface to load rates from a choice of sources – OANDA, Xignite, Reuters, XE, ECB, UK HMRC, Bank of England and 40+ Central Banks – directly into Oracle EBS. Set it up to run on a schedule you choose and it will load rates in the background – no user action or checking is required. Rates are loaded using Oracle-supported APIs and extension standards. 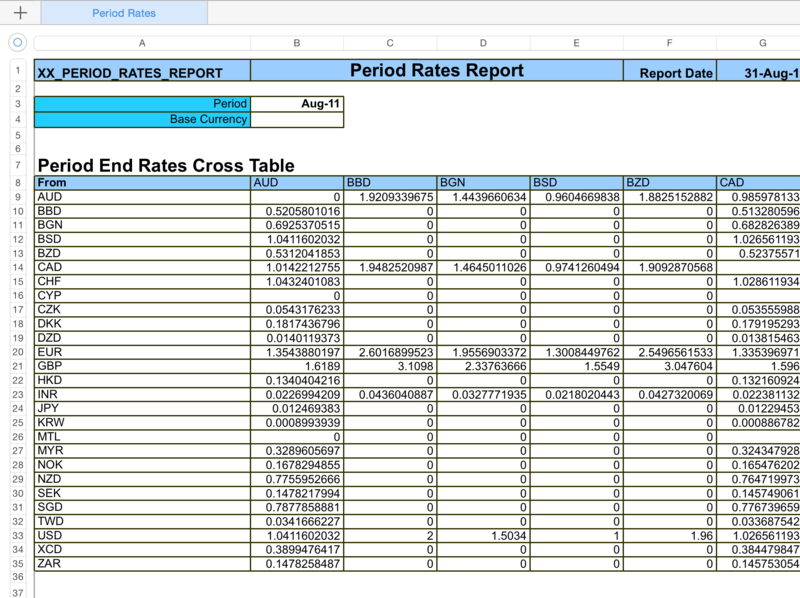 Period Rates are used in Oracle General Ledger for the revaluation and translation processes. From release 12, Oracle General Ledger uses daily rates of separate rate types to hold the period end and period average. These rate types are entered against each Ledger so Oracle knows which rates to use. Period end rates are straightforward; you can use the same rate type as your transactional daily rates. However, period average rates are not calculated for you by Oracle. Oracle expects the period average rates to be already loaded into the rate type you specify. This means calculations outside the system and manually entering the rates into Oracle, every period end. Mistakes when entering period rates lead to incorrect revaluations and translations. FXLoader provides a fully automated process to calculate the period average rates from the Daily Rates you have already loaded. It then loads these into the rate type you specify, ready for use in revaluation and translation. In release 11i of Oracle E-Business Suite, period rates are held separately from daily rates and need to be entered manually in every Set of Books. Period Rates are period end and period average exchange rates used for Oracle General Ledger Revaluation and Translation processes. Manually typing in period rates is the only method Oracle provides. This only needs to be done once per month, but for organizations with many Set of Books this can represent a large effort. Mistakes when entering period rates lead to incorrect revaluations and translations – the source of which can be tough to track down. FXLoader provides a fully automated process to calculate period end and period average rates from the Daily Rates you have already loaded. It then loads these into your Sets of Books according to the base currency of each. After loading your currency rates, you may want to make those same rates available to users or other applications. FXLoader provides an inquiry web page to display your Daily Rates. This sits within Oracle E-Business Suite, but does not require the user to login, so can be made available to anyone in your organization. 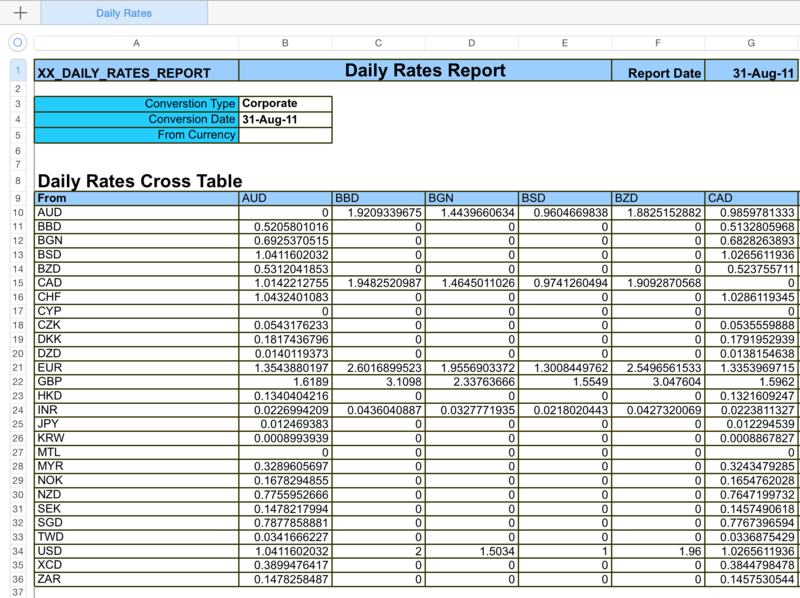 FXLoader also provides reports from Oracle E-Business Suite for Daily Rates and, prior to Release 12, Period Rates. These use Oracle XML Publisher (BI Publisher) to produce reports in Excel format.